Holy Prophet Muhammad (PBUH) received his first revelation from Allah (the one and only creator) at the age of 40. Half decade before that, when he was 35, a devastating flood damaged the Kaabah. 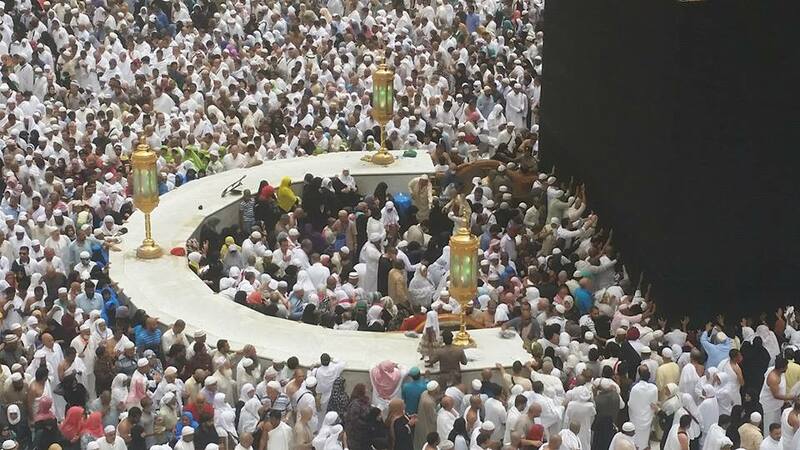 Weakened by an earlier fire, the kaaba was in danger of collapsing. Seeing that the tribe of Quraysh decided to rebuild the Kaabah. Although they were dwelling in all sorts of evil acts at that time (before Islam) yet they decided not to use money gained from improper means like usury (interest), prostitution or thieving. However, they were unable to collect enough pure money to rebuilt the Kaabah completely. They built most of portion of Kaaba from the resources they could managed from good means and left a small wall around the remaining portion showing the boundaries of the original foundation laid by Prophet Ibrahim (Abraham PBUH). The area enclosed by this small wall is called as Hijr or Hateem and is on Northern side of the Kaabah. This area was never constructed and made part of Kaaba afterwards. The area inscribed in the semi-circle wall shown in below photo is called Hijr or Hateem. It is said that the actual area which was part of Kaaba and was not constructed is approximately 3m in width adjacent to Kaaba Northern wall. However, the whole area inside this arch is called Hijr or Hateem. Some also call it as Hijr Ismail. Kaaba (cube) interior is not accessible to public. However, as stated in above Hadith (saying of Prophet Muhammad PBUH) praying in Hateem is similar in blessing as praying inside Kaaba. So if one has desire to pray inside Kaaba, (s)he can pray in Hateem. Personally, I try to pray as close as possible to Kaaba wall without disturbing others. Be noted that Farz (obligatory) prayers cannot be offered in Hateem. Hateem is evacuated by guards prior to all five obligatory prayers. However Nafal (optional) prayers can be offered in Hateem. Also remember that while doing Tawaf (circumambulating around Kaaba), one must walk outside of Hateem as it is considered part of Kaaba. This is such unique information. Thank you for sharing.